To view a copy of any specific document, click on any of the underlined blue links. 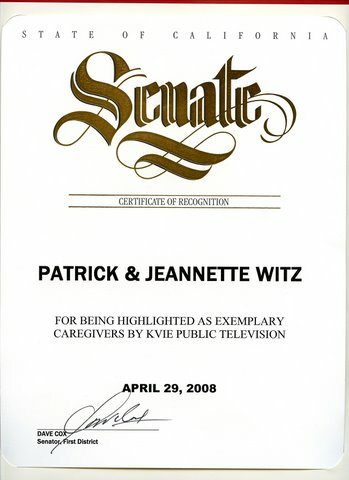 A Place Of Our Own Child Care Provider Of The Week: Honorably recognized by the early childhood educational PBS TV series “A Place Of Our Own” as "Child Care Provider Of The Week", that aired a five-minute documentary on Creative Kids Preschool & Child Care owners Jeannette and Patrick Witz for their dedication and exemplary work in caring for young children, May 16, 2008, on national TV. 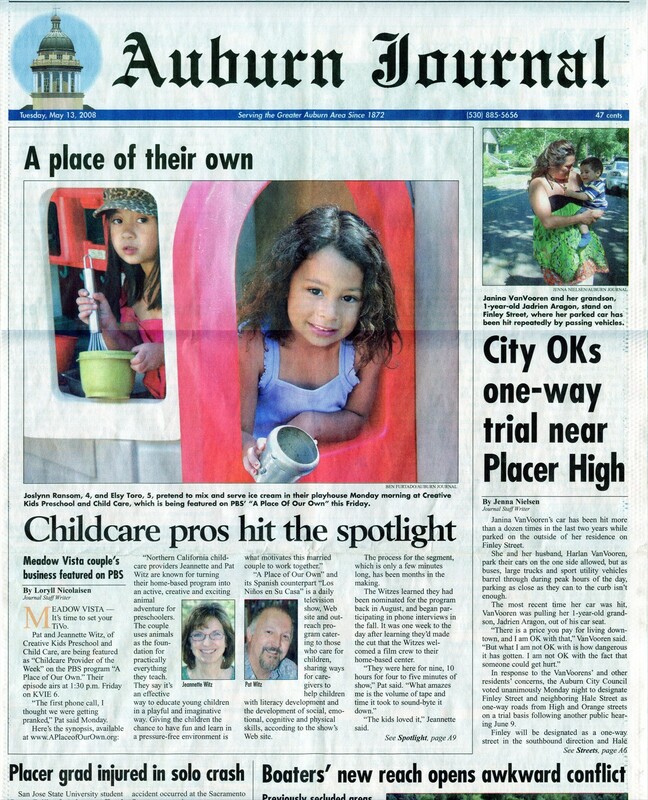 Child Care Pros Hit The Spotlight: Auburn Journal Newspaper front page article May 12, 2008, highlighting Creative Kids Preschool & Child Care's excellence and commitment to child care by the California State Legislators and Placer County Superintendent of Schools: "Childcare Pros Hit The Spotlight" on the front page and continued on inside pages. 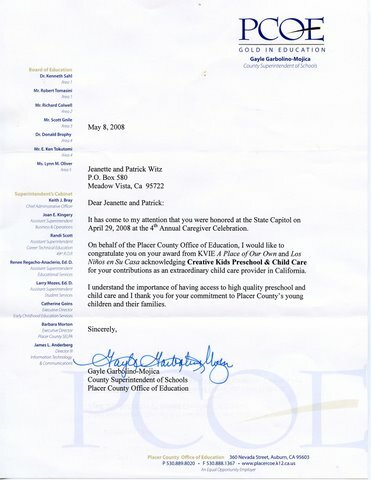 Child Care To Be Recognized On National TV: Gold Country Times Newspaper front page article highlighing Creative Kids Preschool & Child Care's PBS TV recognition: "Local Child Care To Be Recognized On National TV In May"
Newspaper Articles / Photos: There have been over 50 published photos and articles in various local newspapers regarding Creative Kids Preschool & Child since opening in 1993. Some were upbeat full color front page news covering half the page, others are located throughout the paper printed in both color and black & white. NAFCC Nationally Accredited: Twice Accredited, whereas Creative Kids Preschool & Child Care was required to meet or exceed around 300 quality & performance guidelines (only 8 of the over 350 family child care programs in Placer County have achieved accreditation). Charitable Contributions: Recognized by St. Jude Children’s Hospital for Creative Kids Preschool & Child Care's charitable contributions and efforts in organizing, marketing, and conducting over the past eight years an annual “Trike-a-Thon”, where the preschool children have voluntarily rode their tricycles over a combined total of over 900 MILES to generate pledged donations totally over $30,000 to benefit catastrophically ill children. The current individual record set in 2010 by a 7-year-old tricycle rider stands at 275 laps (12.5 miles). Community Involvement: Creative Kids Preschool & Child Care has participated in twenty parades over the years by coordinating support, assistance, and materials from child care parents. 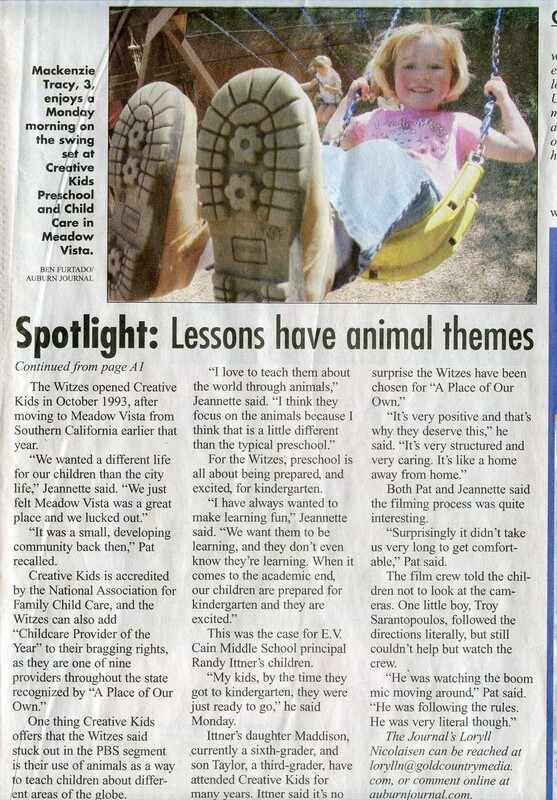 Proudly stated, our float entries have always received overwhelmingly wonderful responses from the viewing crowds, front page photos in local newspapers, and won numerous awards/trophies. Copyright © 1993-2014 by Creative Kids Preschool & Child Care, all rights reserved. translated, hosted, or otherwise distributed by any means without explicit written permission.